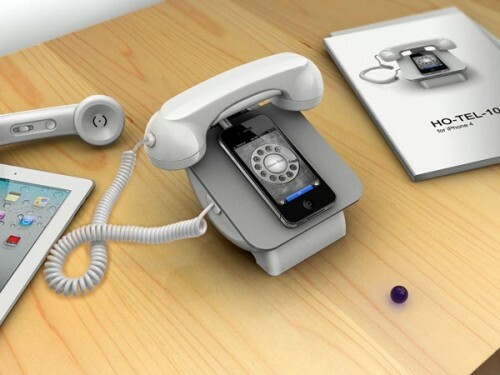 iRetroPhone Brings Back The Rotary Phone For The Apple Age | OhGizmo! There are certainly some of you reading who have no idea what a rotary phone is. We’re looking at you, 90’s born kids… But for the rest of us, the above iRetroPhone docking station/cradle will either make us cringe or lust. Or leave us indifferent… Really, we’ve no idea how it’ll make anyone react so lets just cover all the bases. The iRetroPhone cradles your iPhone, charges it, lets you sync if you want, plugs into the 3.5mm jack and lets you make phone calls old school style. You can even download an application that will replicate the rotary dialler for an even better simulation. As a matter of fact, there’s a bunch of features on this thing, much too many to list here. It works with iPods, old iPhones, iPads, even Android devices. There’s a noise reduction system, a radiation absorber… Just hit the link below to see all the features. Out here you get to find out that if this floats your boat, you’re looking at a wallet ding of $100. Why Apple age? Is the admin such a fanboy? Less crapple, more good stuff please.